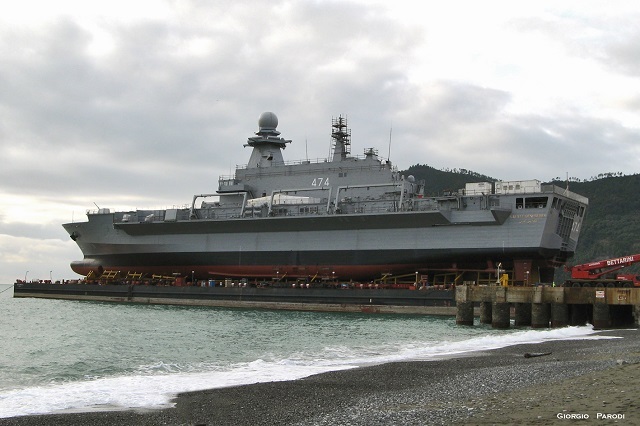 On January 8, 2014 at the Fincantieri shipyard in Riva Trigoso (Genoa) the Algerian Navy future BDSL (Batiment de Débarquement et de Soutien Logistique) amphibious vessel was launched on a barge. According to our sources, the ship (who will be named Kalaat Beni-Abbes) will then be towed to its final completion site of the shipyard Fincantieri in Muddzhiano (La Spezia) . 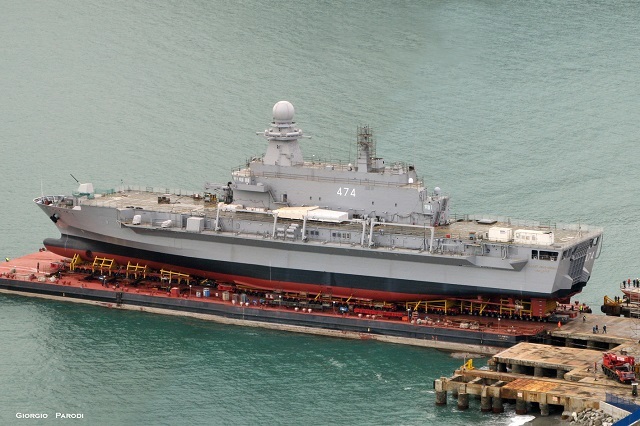 This amphibious vessel (classified as LPD/Landing Platform Dock by the Italian shipyard) was ordered by Algeria in July 2011 under the program BDSL (Bâtiment de Débarquement et de Soutien Logistique) a contract worth more than 400 million euros. The prime contractor for the design and construction of the ship is the Italian company Orizzonte Sistemi Navali (OSN) - a joint venture of the Italian Finmeccanica group and Fincantieri, originally created for the Italian programs of Horizon and FREMM class ships. The Algerian vessel is designed on the basis of Italian San Giorgio class LPD, introduced in the Italian Navy in 1994. However the Algerian vessel will be slightly larger. This new amphibious vessel can accommodate 3 Landing Craft Mechanized (LCM) + 3 small Landing Craft Vehicle Personnel (LCVP) + 1 large Landing Craft Personnel (LCP) + 2 semi-rigid boats. The hangar can accommodate up to 15 armored vehicles. The crew will consist in 150 sailors while the ship may accomodate a landing force of 440 soldiers.